Sean Hayes and Kelly Clarkson wear red noses in support of Red Nose Day, a charity event that raises awareness for child poverty. Odds are you're one of the Americans who don't know exactly what that means. In 2016, Comic Relief USA, which stages the event, surveyed 1,000 Americans and found that "60 percent didn't quite understand what we did," says Janet Scardino, CEO of the group. The short explanation: It's a campaign to raise money to fight child poverty. But how does buying a red foam nose at a drugstore for a buck help the cause? And does this charity with the silly name really do good work? We did some reporting, and here's what we learned. The British charity Comic Relief started Red Nose Day in England in 1985 as a way to raise money to fight child poverty. Why Red Nose Day and not, say, Fight Child Poverty Day? It's hard to get a definitive answer. But it appears the organizers wanted a symbol that would make people laugh. Everyone from Justin Timberlake to Mindy Kaling have put on red noses to promote the fundraising effort. Red Nose Day is held every two years in the U.K. and has raised $1.4 billion, which is distributed to charities that fight child poverty. Four years ago, the event crossed over to the U.S., where it's become an annual event. In the weeks leading up to Red Nose Day and on the day itself, money is raised in all sorts of ways. 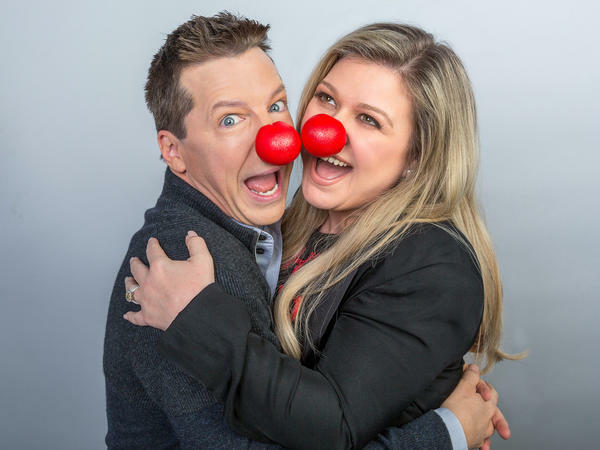 Of the dollar people pay to buy a red nose — including a new sparkly version flecked with silver glitter — at Walgreens and Duane Reade drugstores, 50 cents goes to charity (the other half covers the cost of producing the nose). Since April 2, the charity has sold 9 million red noses, resulting in $4.5 million in proceeds. But there's lots of other ways to give. On the fundraising website Omaze, people can donate up to $5,000 to win a picnic with actor Hugh Grant at the park featured in Notting Hill or join the cast of The Crown for a garden tea party. Eighty percent of the donations raised from these experiences goes to Red Nose Day USA. In the weeks leading up to the big day, the charity releases short online films to encourage donations. In one video, Victoria Beckham of the Spice Girls, a longtime supporter of Red Nose Day, visits Koro Kocho, one of the poorest neighborhoods in Nairobi, and talks to the organizers and students of BoxGirls, a Red Nose Day-supported program that uses boxing to teach girls self-defense and help build up confidence. The highlight of the event is a three-hour telethon, which will take place on Thursday night on NBC, hosted by comedian Chris Hardwick. Viewers are urged to call in and make a donation during the programming. It includes a game show, hosted by comedian Jane Lynch, featuring Jack Black, Kelly Clarkson and Isla Fisher, and a special episode of Celebrity Ninja Warrior. The last hour of the evening will include videos of Comic Relief's work to combat child poverty in the U.S., Puerto Rico and poor communities in Africa, Asia and Latin America. The charity works with nonprofit organizations like Feeding America, the Boys & Girls Clubs of America, Save the Children and Gavi, the Vaccine Alliance to distribute food and medicine to children in need. According to the organization's 2015 tax filings, these partners receive 85 percent of Comic Relief's proceeds. Red Nose Day also receives funding from corporations like M&Ms, which donated $1 million this year. And the Bill and Melinda Gates Foundation, a supporter of NPR, is offering a public match of $250,000 to encourage donations via email. Charity Navigator, which rates nonprofits using a four-star evaluation system, has found that most of Red Nose Day's charity partners have a three or four-star rating. Then there's the question of the goofiness of it all. Part of the appeal of Red Nose Day is that it makes people feel good, says David Bishai, a professor who specializes in economics and public health at Johns Hopkins University. "The red nose doesn't drag you into the dark side of the poor, showing you children with swollen bellies. That's not fun," he says. "The [campaigners] say: We understand there's terrible suffering in the world and we're doing something about it." But it's a tricky line to toe. On Red Nose Day last year in the U.K., the BBC telethon garnered 150 complaints for profanity and lewd comments from the celebrity entertainers. There was a skit showing a bounty of biscuits followed by footage of a starving infant in Liberia. One viewer tweeted: "Comic Relief ... painful." Asked to comment on the controversy, a spokesperson for Comic Relief U.K. did not address the issue specifically but told NPR: "The broadcast was a live studio event enjoyed by a peak audience of 7.6 million. The amazing British public yet again dug deep to raise over 73 million pounds [about $94 million in 2017]." U.S. campaigns haven't brought in quite as much: more than $100 million in the first three years. Still,"that's nothing to sneeze at," says Sandra Miniutti of Charity Navigator. But the name might be an obstacle, suggests Miniutti. "Stand Up For Cancer, I know I'm giving to cancer," she says. "Red Nose Day doesn't have that attribute." It sounds gimmicky, but academics who study charitable giving don't seem to mind. "I could have been holy about it — but they're helping Americans think about those less well-off in other countries," says Bishai. "Give them a break."